Folks are drawn together by a cozy fire. It is against the backdrop of an outdoor fire where old pals laugh, romances flourish, stresses are hypnotized away and kids get their s'more cravings appeased. 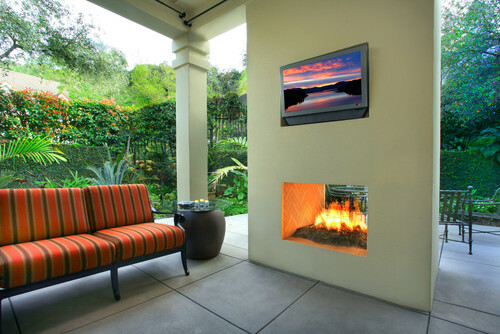 Looking to add a fire feature to your backyard? Here are some ideas to, ahem, fire up your imagination. Au naturel. A wood-burning fire is as elemental as it gets. That wonderful, unmistakable smoke smell hangs on to clothes and hair long after the flames die out, acting as a joyful reminder of camping trips and beach bonfires. 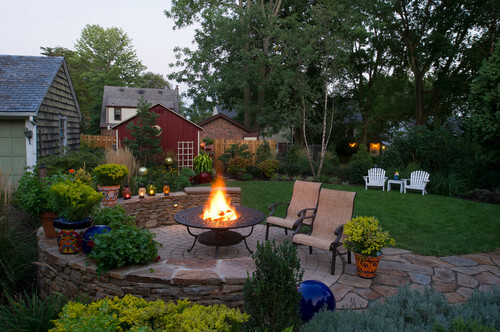 This wood-burning fire pit built within a table was put in by Gasper Landscape Design & Construction to offer the real deal in this backyard entertaining area. Gather round, everyone. A fire feature brings people together, sometimes so many that it's impossible for everyone to fit around it. 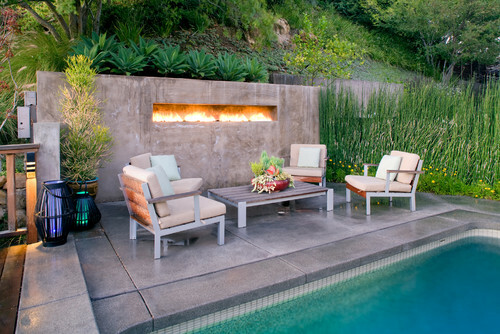 Estate Pools & Landscapes designer Gary Sewell fixed that issue on this Fire & Ice project by creating a double-sided, gas-powered fireplace that has seating arrangements on both sides. A word about using gas: "A lot of cities, especially here in California, are outlawing wood-burning fireplaces," says Sewell, who lives in Southern California. "Gas is a great way to go because you can use colorful glass inside that the flames dance over for added beauty. In addition, there's no embers, ash or smoke to contend with." This is especially helpful in regions where air quality is a big concern, as well as for those who suffer from asthma — or who have neighbors who do. Linger longer. 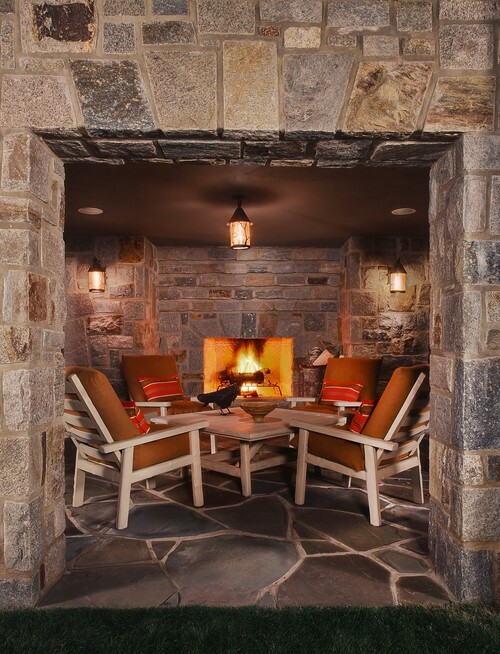 When a fireplace is within an enclosed space, such as this patio designed as part of an entire house project by Kathleen McGovern Studio of Interior Design, the party can continue despite any weather changes. Even with its wide walk-throughs, the sheltered enclosure retains heat well. Tip: Have blankets on hand to keep guests from making a quick exit if the temperature drops. Earth, wind and fire. We should all be so lucky as to have our patio overlook the ocean. But even a backyard may still be prone to the same sort of windy conditions. 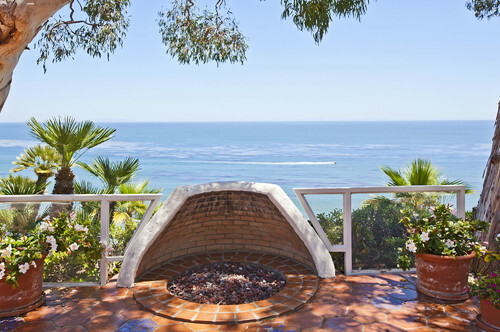 Arto built a rounded half wall around this gas fire pit to protect guests from getting licked by flames. Mitigating high fire risks. No matter your decision to use a gas or wood-burning feature, fire safety has to be the number-one priority. When the owners of this Los Angeles residence considered their options, they consulted Jeff W Troyer Associates for expert advice. "My clients originally wanted a wood-burning outdoor fireplace," Troye notes. "But because the project is in a high fire zone, we could only use natural gas with an electronic starter. As an added advantage of natural gas, we had the flexibility to create a more architectural shape, like this 8-foot-long band of fire at the end of the pool. We supplied the gas from both ends of the opening, to ensure that the flame is even all the way across." This even flame shuts off easily with the flip of a switch, ensuring a safe experience. Tip: Make sure your chosen location for any fire feature (gas or wood-burning) is clear of any foliage. Fire on water. 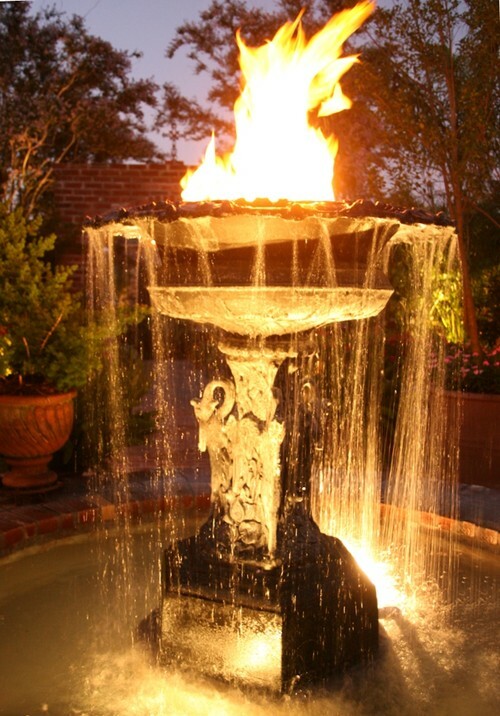 The inspiration for this custom water and fire fountain at the Feucht Estate in Louisiana, designed by Richard Hymel, came from the famous Pat O'Brien courtyard in New Orleans' French Quarter. How it works: The black powder-coated-aluminum urn was plumbed for water, while a manifold pipe system — created by Bubenski's Fire Features — pumps in natural gas to create a floating fire effect. By candlelight. Not sure you want to invest in a fireplace or fire pit? 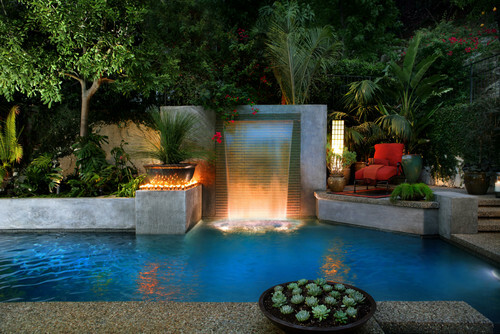 Sewell suggests grouping candles together, as he did next to this water feature. They add beautiful ambience for a fraction of the price and no commitment to location. HOW MUCH WATER DO SHRUBS NEED? WHICH FERTILIZER DO MY PLANTS NEED?